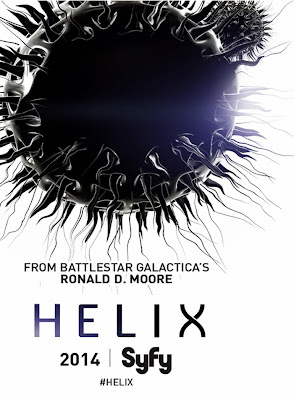 SyFy’s new sci-fi/horror show Helix has created a startling first impression. It’s incredibly well-made, tense and briskly paced. A CDC team is called into an unregulated research facility in the Arctic after a group of shifty scientists unwittingly unleash a strange and deadly virus that threatens the entire base (and possibly the world). The cold, isolated and claustrophobic setting is reminiscent of The Thing, the slowly unravelling mystery echoes the rich mythology of Lost, and the enraged virus-controlled victims feel like something out of 28 Days Later. The production values are remarkable for the the Sharknado-network. It’s beautifully shot with sweeping cameras, the out-of-focus slow-mo, and artistic close-ups. The soundtrack is pulsing with muted electronica that creates moody and ethereal soundscapes (juxtaposed with eerie spells of cheerful elevator music). 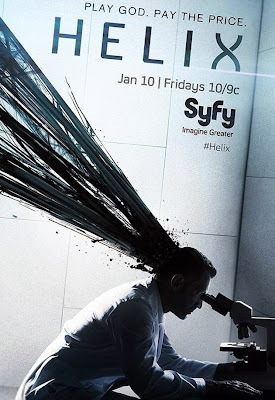 The top-notch cast, lead by the always affable Billy Campbell, is committed, tuned-in, and believable as scientists! And when the goo hits the fan, it’s not pretty. This is one of the most intriguing and chilling new shows of the season – intense, full of dread, serious to the bone, and action-filled. I hope this kind of quality can be maintained throughout the season and hope the big reveal will be truly mind-blowing, as the stunning promo poster below suggests.